Throughout the passage of time, pastry and culinary gourmets alike have gone through many lengths to create unique ways of dazzling our somewhat bored palates. Thank you, God, for providing the world with innovators who dare to be different. Where would we be without the courageous human who was so hungry, he decided to eat snails? The sultry subject of chocolate has been the object of obsession in my mind in recent months; and I have been on a ravenous search for anything chocolate. I just came across a blog post in “Serious Eats” on how to make chocolate covered bacon. At first, the thought was hard to swallow, chocolatey meat? But, I realized how versatile pork is. It has a natural wonderfully vibrant flavor to begin with, and I know how well it pairs with a few slices of Granny Smith apple. So yeah, curiosity got the most of me and I tried it, the rest is history; it was absolutely delicious! Chocolate and bacon are at the very top of my list of edible favorites. I hold them both dearly in my heart, they have brought me comfort many a time. Yes, the seemingly bizarre combination of applewood bacon, smoked salt, and milk or dark chocolate creates the perfect trifecta! If you are a bacon and chocolate lover this will be a superb snack. For those inquiring minds that want the recipe for this sweet salty goodness rolled in to one; I have provided the perfect concoction right here for you. 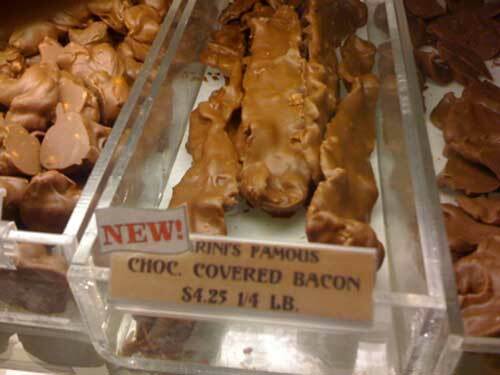 Makes 6-8 slices of chocolate-covered bacon.